ElectroStatic Discharge (ESD) is silent, quick and potentially lethal to electronic parts. When electronic parts are not properly handled during manufacturing, assembly, storage or shipping, damage from ESD can reach into the millions of dollars each year. We know what you’re saying now: "But non-shielding containers are so much less expensive than ESD shielding containers." Unfortunately, it’s not as simple as that. 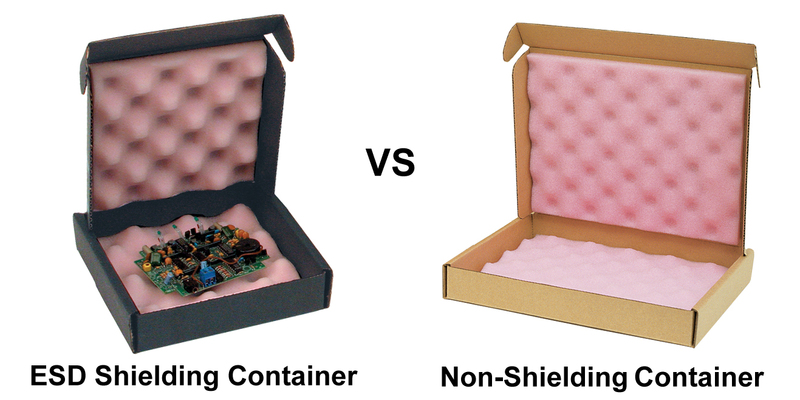 Non-shielding containers might be cheaper, but they are not less costly when it comes to handling ESD sensitive items. Anytime ESD sensitive parts and assemblies are handled, regular containers are not a sound option, even part of the time, as the risk of ESD damage is always lingering. As a result, costs will be incurred, either via ESD damage or as an additional investment in discharge shielding packaging and material handling containers. The cost of a discharge shielding container is far less than the cost associated with damaged parts or extra handling that result with a "less expensive" non-shielding container. So the bottom line is: ALWAYS go for shielded containers! 2. Put a lid on it! A Faraday Cage effect can protect ESDS contents in a container with a shielding layer (this is what a shielding bag has). This Faraday Cage effect protects people in real life when a lightning bolt strikes an airplane or automobile with the charge residing on the outer metal fuselage or car body. The Faraday cage effect causes charges to be conducted around the outside surface of the conductor. Since similar charges repel, charges will rest on the exterior. To complete the enclosure, make sure to place lids on boxes or containers. Packaging with holes, tears, or gaps should not be used as the contents may be able to extend outside the enclosure and lose their shielding as well as mechanical protection. Inside the EPA, it would still be a good idea to have the lid in place, but it is not a requirement. When using a shielded container, electrostatic charges and discharges take the path of least resistance. Packaging with the discharge shielding property protects ESD sensitive items from the effects of static discharge that are external to the package. 3. Choose the right foam! Generally speaking, there are 2 types of foam available with shielded containers: pink static dissipative and black conductive foam. Depending on your application and/or budget you should choose the one best suited for you. We hope you found this post helpful and informative - let us know if you have any requests for future blog posts. Desco Europe is the newest brand in the Desco Industries family, consolidating our two previous UK-based brands, Charleswater and Vermason. Desco Europe sells the full range of DII products, manufactured in our facilities in the USA and UK, servicing the European market via trained distributors who will sell the Desco Europe value package and complete ESD solution to all ESD users in their territory, leading with hi-end solutions that mark us out from the competition. Last week we talked about what to look out for when using containers to transport or store ESD sensitive items. In a previous post we talked about 2 types of materials you should be aware of in an ESD Protected Area (EPA): insulators and conductors. Most people are aware of regular high charging tape in ESD Protected Areas (EPAs) and know that these should be replaced with ESD tape.